Certified Nurses Day is an annual worldwide event dedicated to celebrating certification as a means to help ensure high standards of patient care and to promote continuing excellence in the nursing profession. The American Association of Critical-Care Nurses and the AACN Certification Corporation are teaming up with healthcare organizations and hospitals across the country to recognize and celebrate certified nurses for their professionalism, leadership, and commitment to excellence in patient care. 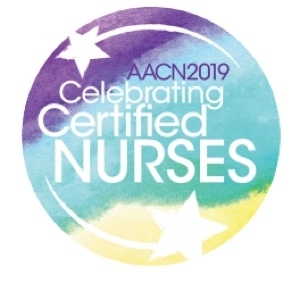 To honor and celebrate Certified Nurses Day, several critical care and progressive care nurse were asked by AACN to describe the extensive and diverse benefits of certification. As healthcare becomes increasingly complex and challenging, the value of nursing certification as a mark of excellence is more important than ever. Achieving certification demonstrates to patients, employers, and the public that a nurse’s knowledge reflects national standards and a strong personal commitment to patient safety. Read a few of the stated benefits below. “What I value most about my certification is the opportunities it’s opened up for me – the respect that I receive from my nursing and non-nursing peers, and the changes I’ve been able to make to the nursing practice at my current and previous organizations. I am a better practitioner because of my certifications,” said Sam Merchant, MBA, BSN, RN, CCRN, PCCN, NE-BC, RN-BC, Progressive Care Unit, University Health System, San Antonio. “Besides personal satisfaction and a sense of accomplishment, certification validated all of the knowledge and experience I’ve gained working in the ICU for almost 10 years. My certification has made me a more confident nurse, knowing what I’ve been doing for my patients is aligned with national guidelines and standards for excellence in patient care,” said Erica McCartney, BSN, RN, CCRN-CMC, ICU/IMCU resource RN, Swedish Medical Center, Edmonds, Washington. “Certification opened doors for me by allowing my supervisors to trust me enough to teach competencies and mentor new nurses. My supervisors trusted my nursing and clinical judgment enough for me to become a valued resource on our cardiac unit. Certification allowed me the opportunity to climb our clinical nurse ladder, which also provided an additional monetary component,” said Kendra Armstrong, MSN, RN, ACNPC-AG, PCCN, acute care nurse practitioner, Phoebe Putney Memorial Hospital, Albany, Georgia. “Being certified is a validation of my commitment, experience and clinical expertise. I am proud to work along with my fellow certified nurses every day. It is a constant reminder and reassurance to our patients and family members that they are receiving the highest quality care. Certified nurses are determined professionals who invest in their professional and personal growth – they inspire me to be the best,” said Sherley John, MSN, RN, CCRN, clinical nurse, Neurosurgical ICU, North Shore University Hospital, Manhasset, New York. Congratulations and a big thank you to all certified nurses. You deserve to feel very proud! To read more about Certified Nurses Day, please see the complete AACN Press Release. Also view the video below of an interview with Karen Kesten, DNP, APRN. Getting and maintaining certification is a positive step in your nursing career. I appreciate certification for all the learning I have to do to attain the certification! I always found that just the process of attempting various board certifications helped me increase my knowledge base and gave me confidence in providing the best care. Happy Certified Nurses day to all my certified peeps!